Are you really getting what you paid for? ne of the major points of high-end food tends to be its presentation. After you get to a certain point, there’s no real way to make the food actually taste better, so other things are done to make it seem more appealing, even though these efforts on presentation have no affect on the taste of the final product. So here, the customer ends up paying more for getting a better show and presentation, but not really much better in terms of the actual dish. his type of thing happens because we have this false assumption that the more expensive that something is, the better it is. While this can be true up to a point, there is a plateau at which there really isn’t any way to get a better quality out of what you are making. For example, if you have the same ingredients that go into a dish, and two different chefs prepare it perfectly, what do they do in order to get you to come to their restaurant? One of them may decide to go for a fancy presentation, while the other may decide that the food doesn’t need the extra presentation. The one with the fancy presentation is going to cost more, since truffles don’t simply grate themselves. Ultimately, however, you end up with two perfectly good dishes at different price points. One may give you one big slice of cake, while the other may take the same slice, but cut it up into tiny pieces arranged on the plate with a little swirl of chocolate sauce around it. Everyone has their own preference, and sometimes people zwill pay extra for the presentation because they like it. You see a similar thing when it comes to lenses - many places have the same input, same machines, and same processes, yet some charge way less than others. This happens not because there is something ‘wrong’ with the lenses that cost less, rather it is because they are usually not adding extra ‘fluff’ in their presentation. When we’re talking about a special dinner out, this extra fluff can be a nice touch. When we are talking about cost-effective products for your business, however, the cost of the extra fluff can really add up quickly. In these situations where the bottom line is important, it’s necessary to ensure that you’re really getting as much cake as possible for your dollar. This isn’t about going in and buying all the day-old, stale product that nobody wants just because it’s cheap. The important thing to stress here is not that you settle for a lower standard of product, but that you consistently get what you need without all the extras that you would otherwise pay for with a higher price point. The major reason for a perceived ‘lack of quality’ at lower price points can often be because those with a higher price point are going to tout how much better they are as a matter of course. They have to be better, otherwise the higher price doesn’t seem justified. So, either they need to be seen as ‘better’, or the guy with the lower price has to be ‘worse’ or something has to be ‘wrong’ with whatever he is selling. That’s how it goes in any business. If the guy that was more expensive came out and said “Our product is the same as the other guy - but our sales rep buys you cake (or bagels, donuts, etc.) every six months, so that’s why we charge 40% more,” then you probably wouldn’t buy their products. You can buy a lot of cake with the difference in price, and you can make sure you get the kind you actually like that way, as well. As nice as that personal experience is of getting that cake delivered, however, you need to decide if that’s actually worth the cost from a business perspective, and not a personal one. 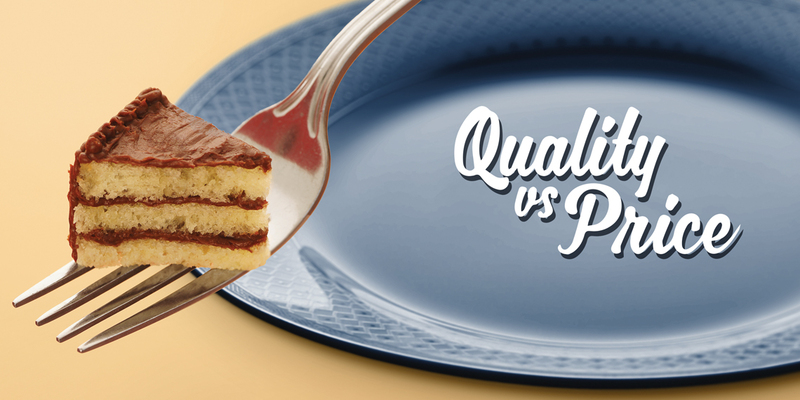 What you need to decide, the next time you have a piece of metaphorical cake for your business (like regular cake, just non-existent and zero calories), is whether you get anything out of paying extra for one piece that gets delivered to you on a silver platter, or if you’d just rather go to the bakery and get a whole cake for the same price.